Our family recently went on vacation to the Pacific Northwest. My brother and sister both live South of Seattle. My husband’s brother lives in Portland. Sweet Pea had never been out there, so we decided to see the area and the cousins, all in one trip. Our visit with family was amazing. Really– there is nothing like family, right? However, we were fortunate to have a blast touring the area as well. So, I thought I would do a short series of posts on some of the best places we visited. There are really probably a million great reasons to visit the Pacific Northwest. However, we had limited time and the need to find activities that would be fun, but not completely overwhelming for a 2 year old. The Point Defiance Zoo and Aquarium in Tacoma is definitely that kind of place. 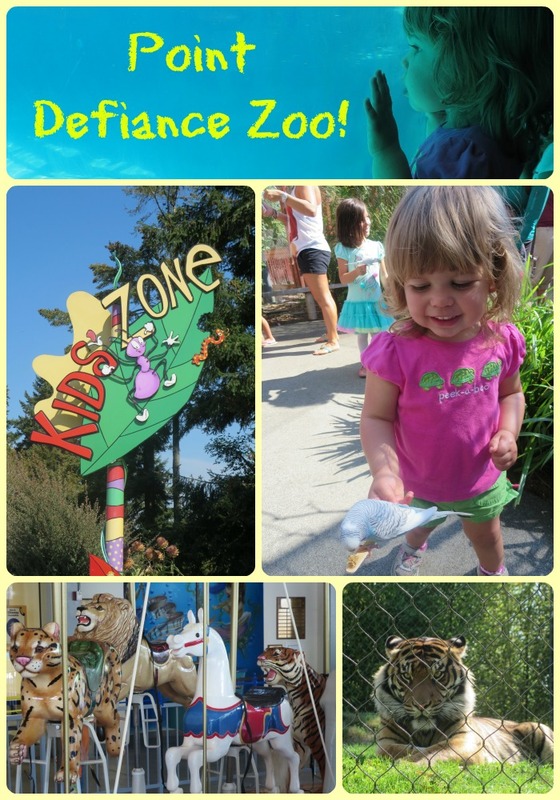 The Point Defiance Zoo is nestled inside the amazing Point Defiance Park, which in and of itself boasts a great beach, duck pond, rose garden, hiking trails, and other activities designed to foster a love of being outdoors. The zoo is smaller than Seattle’s Woodland Park Zoo, but it is still very impressive. There are six main animal habitats in the zoo, plus an outdoor theater and indoor carousel. We started the day in the Asian Forest Sanctuary watching the Asian elephants feast on their morning snack of apples. Sweet Pea really got a kick out of seeing the elephants up close. The big hit in this area though was the close up of the tigers. Many times visitors don’t get a good look at big cats in zoos, especially on sunny, warm days. That was not the case here. I have never seen a tiger this big, up close and personal. It was very impressive. Leaving the Asian Forest Sanctuary, we weaved around the outside of the Aquarium and had a very fun pit stop at an exhibit called, ‘Budgie Buddies.’ Budgies are brightly colored Australian birds that are quite friendly. The zoo has a special open-air enclosure where over 100 budgies are flying around. Patrons can buy seed sticks for only $1.50 a pop and the budgies will actually fly onto the stick and basically eat out of your hands. Sweet Pea was a little tentative at first, but as soon as one of the budgies landed on her stick and started squawking, she was in toddler heaven. After feeding the budgies, we made our way over to the Rocky Shores habitat. Sweet Pea mesmerized watching the seals, sea otters, and walruses swim and play from the underground viewing areas. Well, to be honest, the walrus scared her a little bit.. but she was brave and overcame. Good girl! I think the highlight of the entire day though was seeing the Polar Bears in the Arctic Tundra habitat. We arrived at the tail end of the Polar Bear Keeper talk– which was immediately followed by feeding and playing time. Everyone in the underground viewing area was treated to an up close look at these huge mammals swimming and playing mere inches from where we stood. It was spectacular! The Red Wolf Woods made a nice segue towards the end of the day. Again, as with the tiger, the wolves were not hiding. We watched as four of them walked out from under the shade, across a log, and into a clearing, where they proceeded to stretch out in preparation for an afternoon nap. Well, that kid of made us tired too– so we headed for the main entrance and spent some time playing at the very toddler-friendly Kid’s Zone. Sweet Pea loved this area of course– she climbed on a number of the play structures, and laughed at the meerkats and monkeys. Oddly enough, the biggest hit with Sweet Pea in this area though was the turtles and frogs. Maybe that is because the exhibits were right at her level. We ended our trip to Point Defiance Zoo with a few rides on the Paul Titus Antique Carousel. This indoor carousel is a re-created wooden carousel that was originally built in 1917. Each ride only costs $1.50. So, of course we went on three rides. When on vacation you have to live a little! Plus, that way Sweet Pea could ride the tiger, the horse, and the lion! Overall, the trip to the zoo was a blast, and totally doable in a half day with a small child. Of course, after all that walking, we were hungry bears! Well, wouldn’t you know that one of the best sandwich places in Tacoma is located literally steps from the entrance to Point Defiance Park? 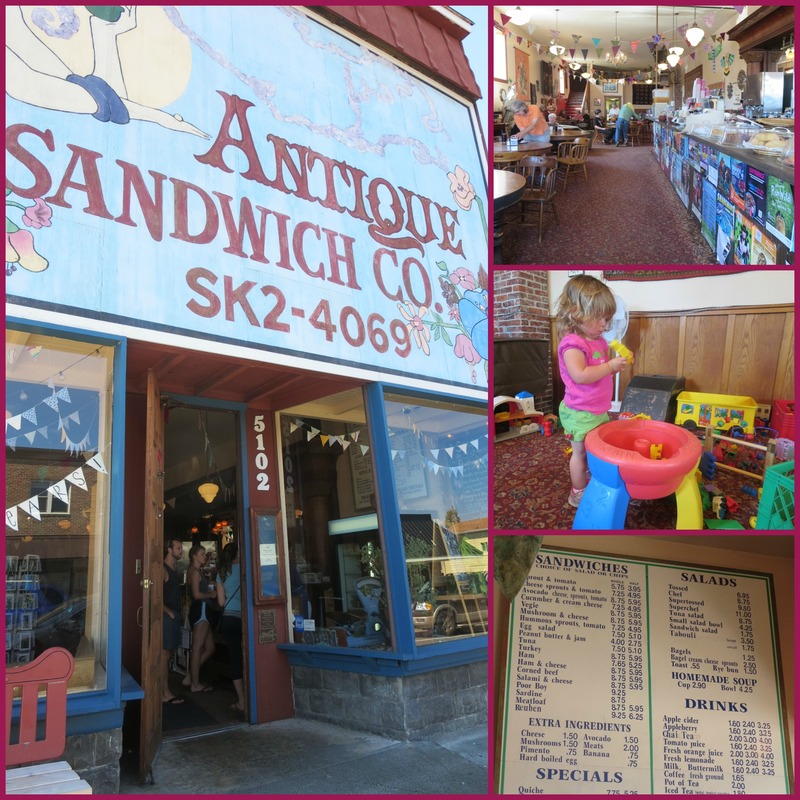 The Antique Sandwich Company was the perfect place to stop for lunch. 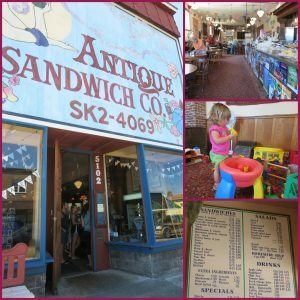 Sweet Pea and I shared a huge homemade chocolate milkshake, a plate of hummus and pita wedges, a big wedge of avocado (Sweet Pea loves avocado), a tall glass of homemade lemonade, and a delicious egg salad sandwich. While we waited for our order to come out, Sweet Pea and her cousin played on the nightly entertainment stage, that was filled with toys to accommodate the ‘younger’ crowd. It was the perfect postscript to a lovely day in Tacoma. So, if you live in the greater Seattle area, or you are just visiting, I would highly recommend checking out the Point Defiance Zoo and Aquarium. … and tell the polar bears we said hi! Previous Post: « Moms! Score Fantastic Deals at the Kid’s Nearly New Sale!